[Citibank ATM] Kick start the new year with more savings. Kick start the new year with more savings. 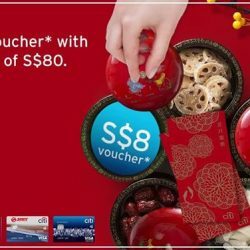 From now till 24 Feb 2018, be delighted with a S$8 voucher* when you spend a min. of S$80 in a single receipt at Sheng Siong Supermarket with Citi Credit Cards. Plus, earn additional 5% SMRT$* with Citibank SMRT Card. [Citibank ATM] Prefer to dine in at the comfort of your home this weekend? Prefer to dine in at the comfort of your home this weekend? From now till 31 January 2018, get savings with your Citi Credit Card when you order from your favourite restaurants via Deliveroo and have it delivered to your doorstep. 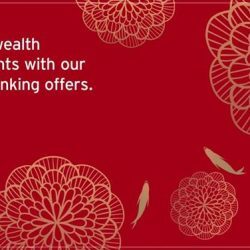 As we usher in the Lunar New Year, start your year afresh by setting new financial goals and managing all your investments with our Total Wealth Advisor. In the spirit of growth and prosperity, and to help you get started on achieving your goals, we have lined up a suite of exclusive banking offers just for you. 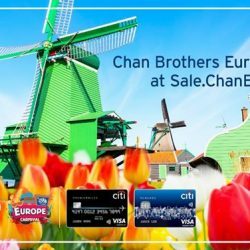 Get up to $1,400 off per couple, 50% off 2nd pax & more at Chan Brothers Europe Carnival with your Citi Credit Card. Join informative sessions by Europe specialists & enjoy a high tea session & exclusive deals for attendees! Head down to Chan Brothers Travel Powerhouse at South Bridge Road, Fook Hai Building Level 1 & 7, this Fri to Sun (19 to 21 Jan 2018). 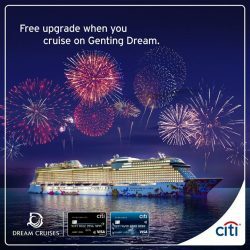 Go on a luxurious journey with Genting Dream Cruise and get a free upgrade from Window to Balcony* when you book with your Citi Card. 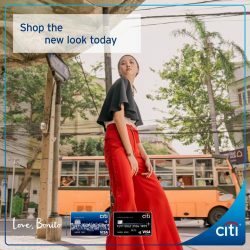 [Citibank ATM] Need a new outfit for Lunar New Year? Need a new outfit for Lunar New Year? Get up to S$25 off at Love, Bonito from now to 28 Feb 2018 with Citi Credit Cards. 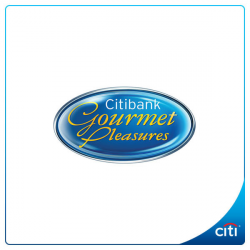 [Citibank ATM] Usher in the new year with these enticing festive goodies. Usher in the new year with these enticing festive goodies. Choose from a perennial of Chinese New Year favourites such as Yusheng, love letters, pineapple tarts and more with your Citi Cards. Offers are valid till 28 Feb 2018 unless otherwise stated. T&Cs apply. [Citibank ATM] New year, new beginnings! New year, new beginnings! Time to do some spring cleaning and purchase new home furnishing, bedding, electronics and IT at Harvey Norman. 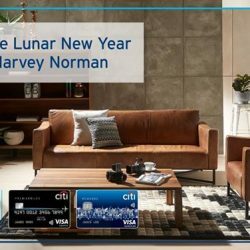 [Citibank ATM] New year calls for new furniture! - Receive a complimentary condiment server* with a min of S$800 with your Citi Card. - Get a free yellow folding stool* when you flash this FB post. [Citibank ATM] It’s time for some Seoul searching! 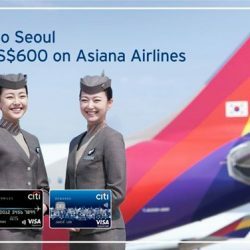 all-in-fare to Seoul from S$600 onwards with Asiana Airlines when you book from 5 January to 14 February 2018. [Citibank ATM] A world of unforgettable experiences await you with the Citi Prestige Card. A world of unforgettable experiences await you with the Citi Prestige Card. From unmatched travel privileges to access to exclusive events and dining soirees, rewards that recognize your Citi relationship and a global concierge, the Citi Prestige experience brings all your benefits together. 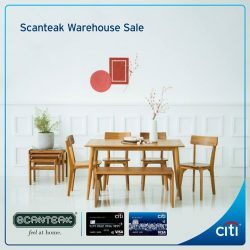 [Citibank ATM] Get new season preview offers at Chan Brothers Private Sale exclusively with your Citi Cards! 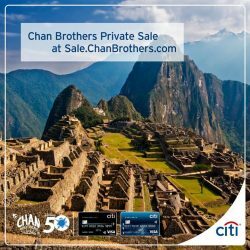 Get new season preview offers at Chan Brothers Private Sale exclusively with your Citi Cards! 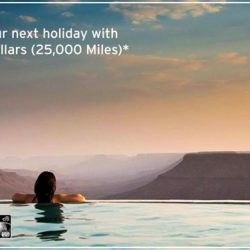 Discover new uncovered destinations such as Greenland, Peru, Croatia, Silk Road, Sri Lanka & more with up to $1400 off 2nd pax. Head down to Chan Brothers Travel Powerhouse at South Bridge Road, Fook Hai Building Level 1 & 7, this Fri to Sun (5 to 7 Jan 2018). 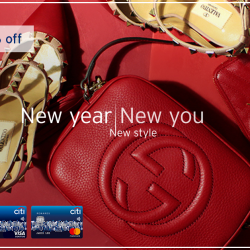 [Citibank ATM] Kick start the new year with power red statement pieces from Reebonz. Kick start the new year with power red statement pieces from Reebonz. 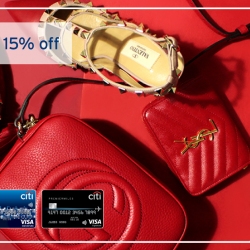 Get up to 15% off at Reebonz with Citi Credit Cards from now to 31 March 2018. 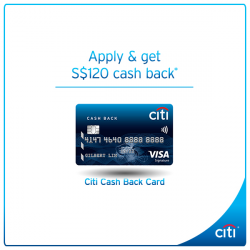 [Citibank ATM] Shop new year essentials at Watsons and get a S$10 return voucher* with your Citi Cash Back Card. 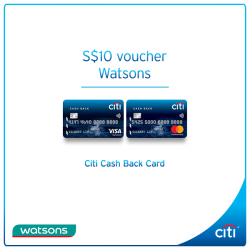 Shop new year essentials at Watsons and get a S$10 return voucher* with your Citi Cash Back Card. Valid with every S$50 spent in a single receipt, from 28 Dec 2017 to 8 Jan 2018. There’s no better time than now to stock up on beauty products, household necessities and supplements! A world of unforgettable experiences await you with the Citi Prestige Card. From unmatched travel privileges to exclusive events and dining soirees, rewards that recognize your Citi relationship and a global concierge, the Citi Prestige experience brings all your benefits together. 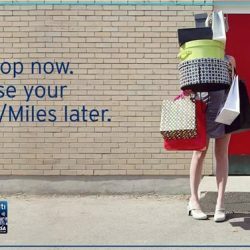 [Citibank ATM] Limited time offer! [Citibank ATM] 7 days left to win a dream holiday and fly business class to either London, Paris or Zurich! 7 days left to win a dream holiday and fly business class to either London, Paris or Zurich! Simply spend on your Citibank Debit Mastercard from 18 to 31 Dec 2017 and if you are our top 3 spenders, you can WIN a pair of business class tickets to the destination of your choice*. Grab your chance to stock up your books, stationery, multimedia products and more at [email protected] 2017 from 15 to 24 December 2017. 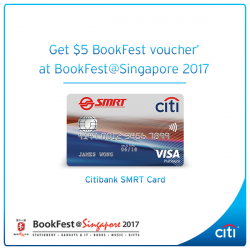 Plus, get a $5 BookFest Cash voucher* when you spend $120 with your Citibank SMRT Credit Card. Venue: Suntec Convention Hall 401 – 406. [Citibank ATM] Reward yourself your way. [Citibank ATM] Fuel the love of driving with up to 22. 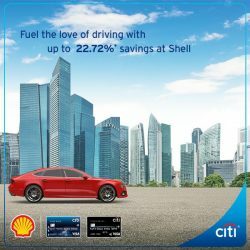 Fuel the love of driving with up to 22.72%* savings at Shell, exclusively with Citi Credit Cards. Offer is valid till 28 Dec 2017. Fuel up at your nearest Shell station today! [Citibank ATM] It’s your last chance to win a dream holiday and fly business class to either London, Zurich or Paris! 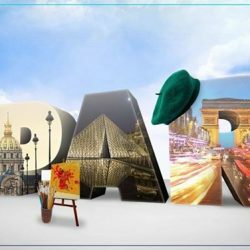 It’s your last chance to win a dream holiday and fly business class to either London, Zurich or Paris! Simply spend on your Citibank Debit Mastercard from 18 to 31 Dec 2017 and if you are our top 3 spenders, you can WIN a pair of business class tickets to the destination of choice*. [Citibank ATM] Don’t miss out on this sign up offer with Citibank Ready Credit! Don’t miss out on this sign up offer with Citibank Ready Credit! 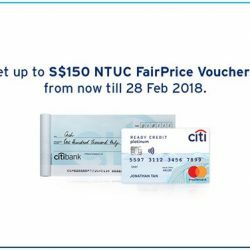 Be the first 1,000 customers to get S$100 NTUC FairPrice vouchers when you transact a minimum of S$500*. 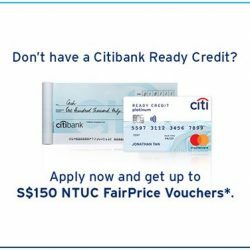 Plus, get an additional S$50 NTUC FairPrice vouchers when you apply for Citibank Ready Credit PayLite at a promotional interest rate of 4.55% p.a. (EIR 8.50% p.a)*. Valid till 14 Feb 2018. 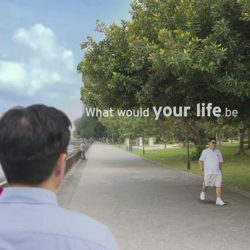 [Citibank ATM] 3 days left to win a dream holiday and fly business class to either New York or Vancouver! 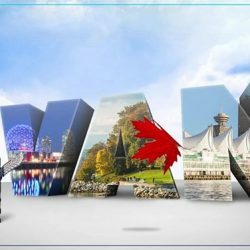 3 days left to win a dream holiday and fly business class to either New York or Vancouver! Simply spend on your Citibank Debit Mastercard from 4 to 17 Dec 2017 and if you are our top 3 spenders, you can WIN a pair of business class tickets to the destination of your choice*. Stay tuned as we unfold new destinations on the 18 Dec for the last 2 weeks of 2017! Promotion lasts till 31 Dec 2017.